Plymouth ferry port offers routes to Roscoff in France and Santander in Spain. Plymouth in Devon, located near to the border with Cornwall, has one of the richest maritime heritages in the World. The famous Plymouth Hoe is the backdrop for Sir Francis Drake’s legendary game of bowls and a beautiful natural harbour. Located here is Smeaton’s Tower Lighthouse, which offers incredible views of Plymouth Sound. There are several war memorials on The Hoe, remembering those killed in World Wars I and II, and the Armada Memorial, which commemorates the defeat of the Spanish Armada. America's "Pilgrim Fathers" left from Plymouth for the New World in 1620 near the commemorative Mayflower Steps in Sutton Pool. The nearby National Marine Aquarium displays hundreds of fishes and other marine species. Plymouth is a popular base for visitors to the dramatic landscapes of Dartmoor National Park and the Tamar Valley, an Area of Outstanding Natural Beauty. Plymouth is ideal for ferry passengers who are travelling from Western England and Wales. 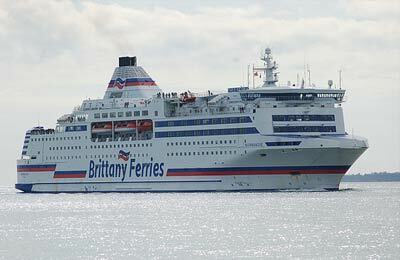 Regular ferry services to Roscoff in France and Santander in Spain are operated by Brittany Ferries. Driving from London, take the M4 west to the junction with the M5 going south to Exeter. From Exeter, head south-west on the A38 to Plymouth. Exit the A38 at the A374 (towards Plymouth City Centre) and follow signs to the Continental Ferryport. The port is clearly signposted from the A38, the main access road to Plymouth. Remember to come off before the Tamar bridge. Frequent trains run from London's Paddington Station to Plymouth in 3.5/4 hrs. Plymouth Train Station lies on North Road, 5 minutes from the City Centre. National Express has frequent daily bus services between London's Victoria Coach Station and Plymouth. The trip takes 5.5 hrs. There is no direct bus from the train station to the ferry port and terminal. There is a cafeteria located inside the terminal building which opens for ferry arrivals and departures only. There is a Bureau de Change located at the Terminal Counter, open from 09:00-17:15 Monday-Friday and 10:30-16:00 Saturday & Sunday and for all ferry arrivals and departures. Disabled parking is available directly outside the terminal building. Escalator and lift available from ground to first floor, Departure lounge is also on the first floor and is where the disabled toilets are located. Please note that toilet facilities in the car lanes are not adapted to accommodate disabled passengers. Additional disabled facilities are available at the Freight check-in office after the security checks. Foot passenger access to the ship is via a long, partially uncovered walk which involves negotiating stairs and slopes, so assistance is required for all those with any walking difficulties. The terminal is manned from 09:00 to 17:30 Monday-Friday and 10:30-16:30 Saturday & Sunday and for all ship arrivals and departures. Parking is available at the port at £10.00 per 24 hours with parking for up to 2 hrs free. Spaces cannot be pre-booked but there are plenty available. Caravans and motor homes can be parked 'overnight' in the car lanes provided they do not interfere with loading for any departures prior to that which you are travelling on. There is no access to toilet facilities during the night.